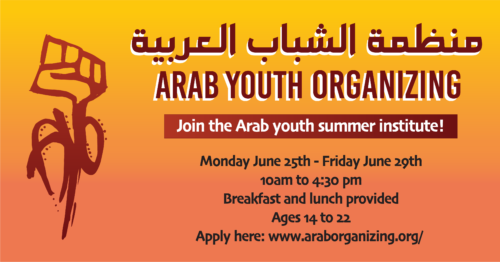 We are happy to announce that AROC’s Arab Youth Organization (AYO) will be having its annual youth summer institute starting on Monday June 25th and will end on Friday June 29th! The institute will provide Arab youth in the Bay Area from different backgrounds with leadership training, political education, organizing skills, and a glimpse of their peoples history. The youth will undergo a number of activities and teamwork building exercises that will allow them to build with their Bay Area Arab community. The goal of the institute is to empower Arab youth through education that will allow them to grow to be leaders in their community. 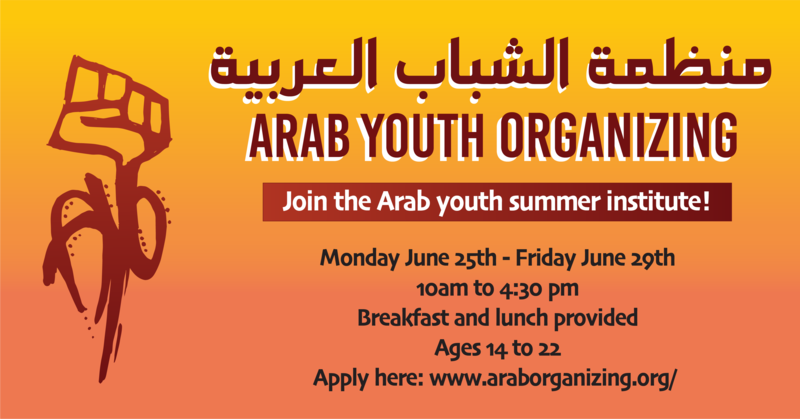 This institute is free and open to Arab or Muslim youth from ages 14-22. Stipends for youth traveling from the East Bay will be available, breakfast and lunch will be provided for each day.